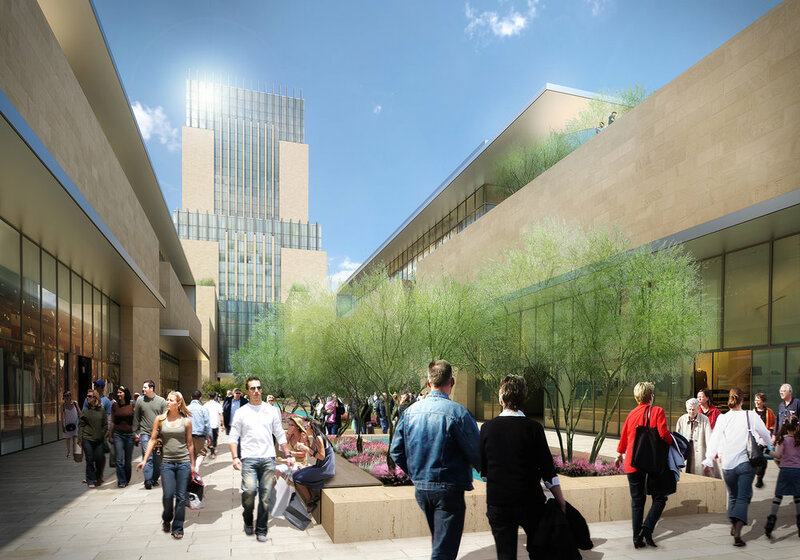 Collaborating with real estate students from San Diego State University, the team developed a mixed-use concept for the three-block parcel occupied by the old courthouses on Broadway in downtown San Diego. Zoning calls for the south and north blocks to be developed at similar heights, with a park in between, but solar analysis shows that the middle block would often be shrouded in shadow. The proposed concept increases in height toward the north to ensure good light throughout the year. A linear garden court creates a pedestrian plaza down the middle, an active public space connecting to the avenue. The space and architecture emulate great public places such as Rockefeller Center and rethink historic local architecture with climate-appropriate regional materials, creating an identity tailored to community and place. PRESS: Highlighted by Downtown San Diego Partnership.